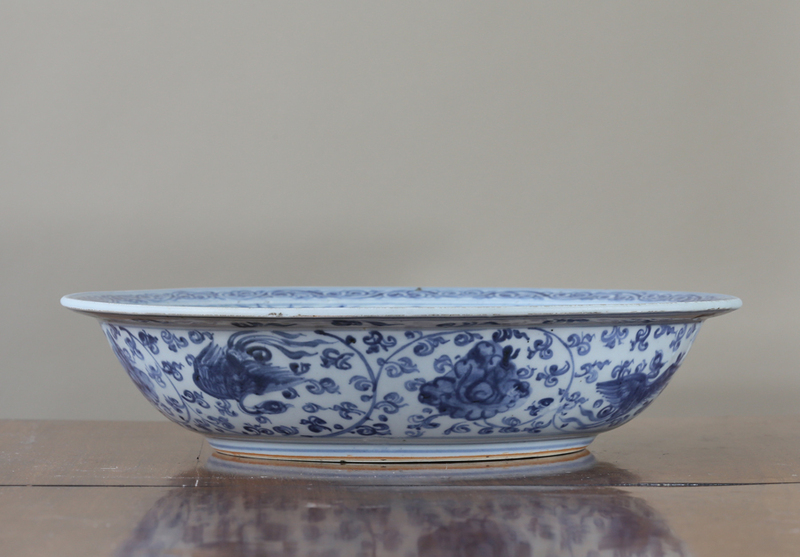 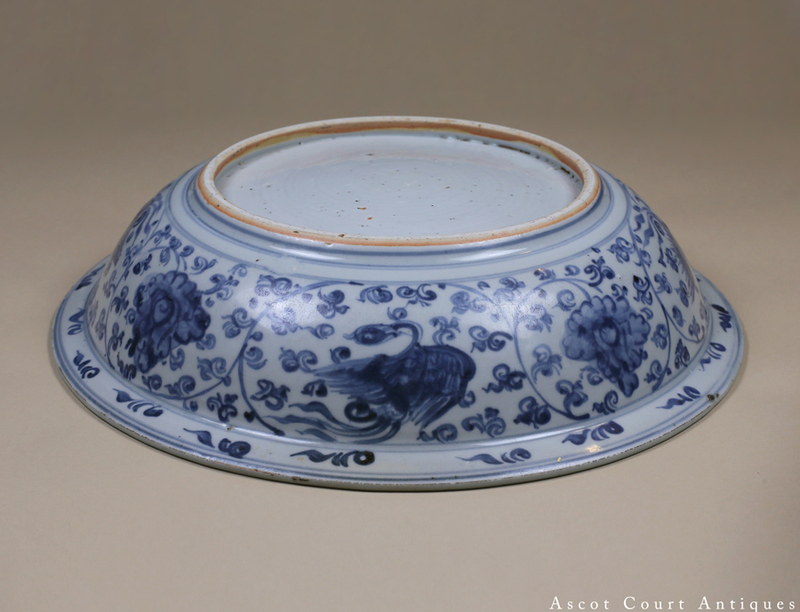 A large and rare mid-Ming Hongzhi period blue and white porcelain charger, sturdily potted in the circular dish form with round curving walls and a flat flared rim. 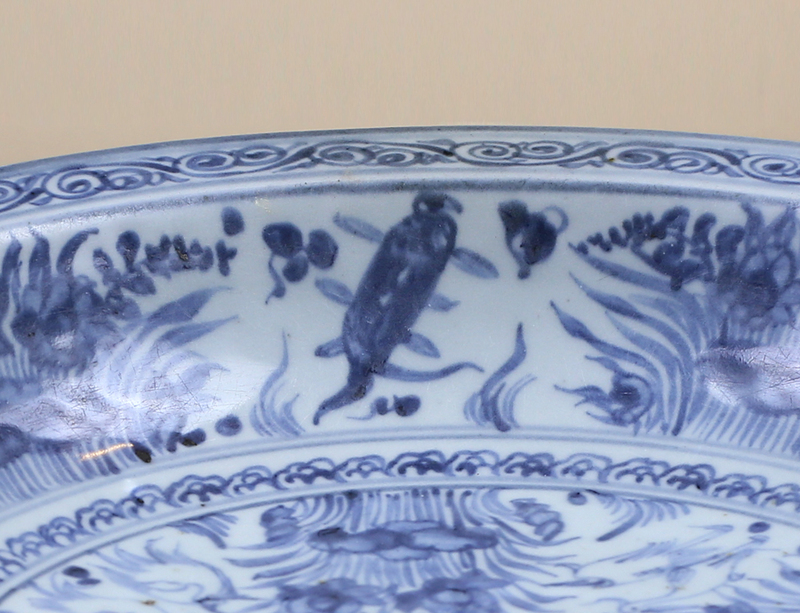 Egrets perch amongst river reeds in the central field while fish swim around aquatic plants in the cavetto. 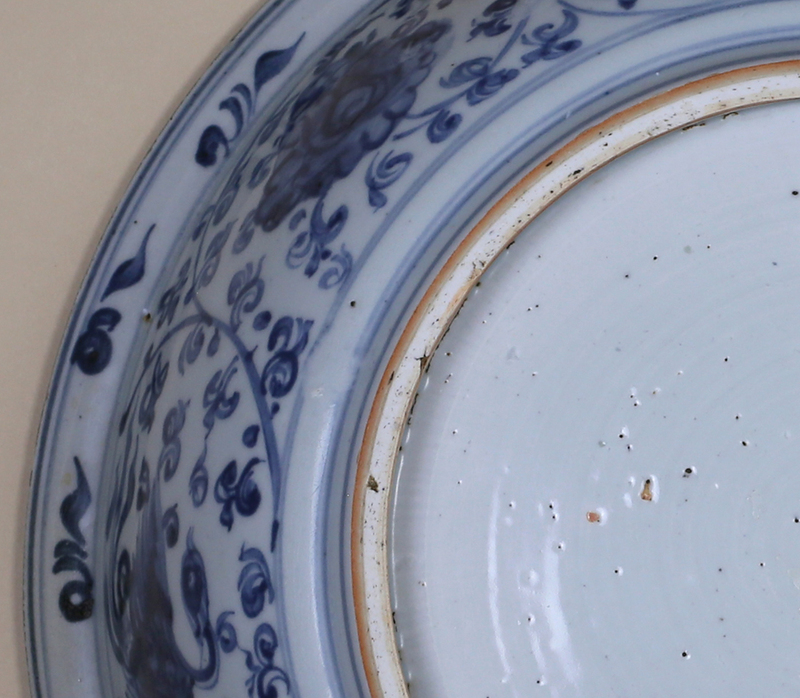 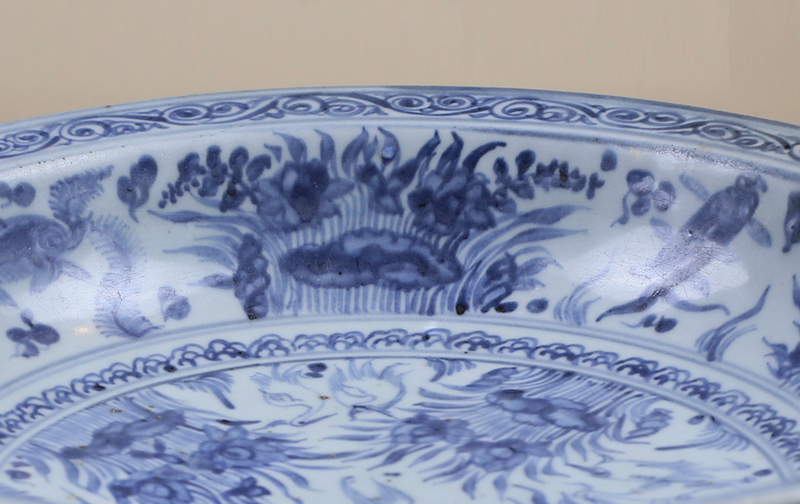 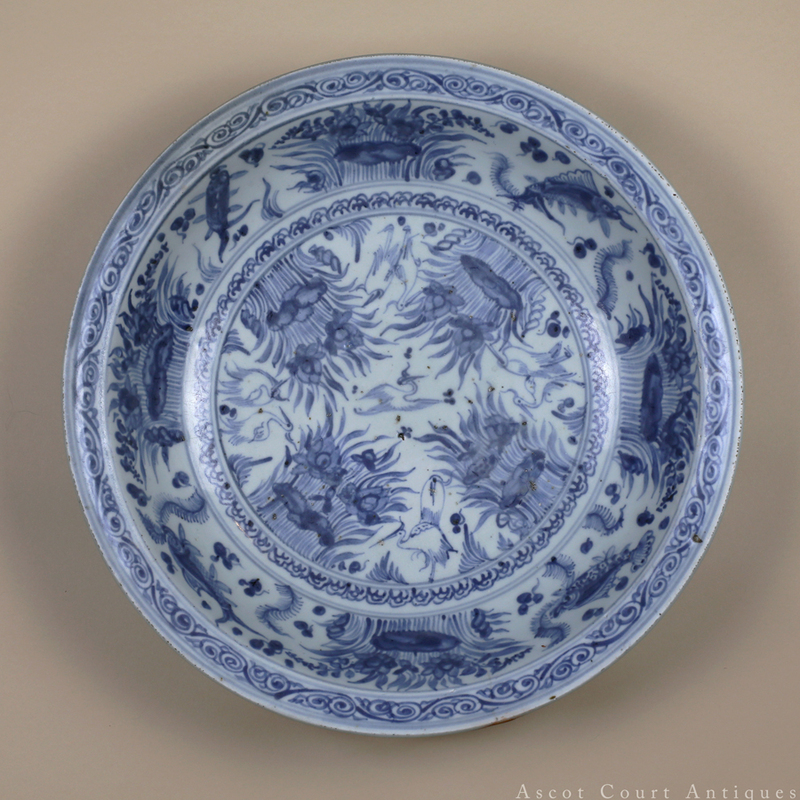 Due to Jingdezhen potters no longer having access to imported cobalt after the Xuande reign, this dish, like all mid-Ming blue and whites, display a more muted and soft expression without the bold pop of Mohammedan blue. 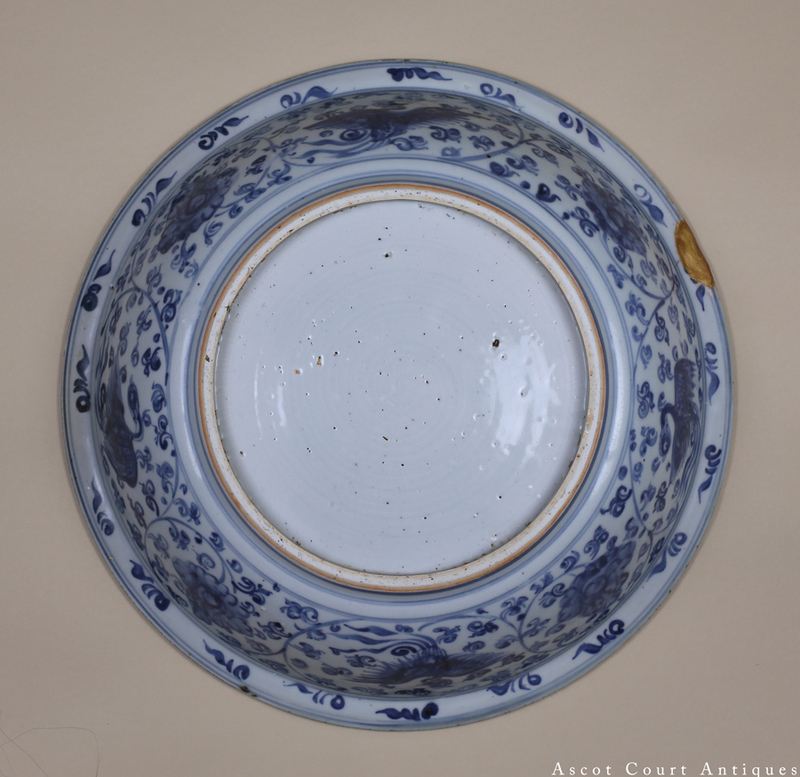 But in painting style, this dish still adheres to the old practice of pigment wash ‘heaped and piled’ painting method from the early Ming. 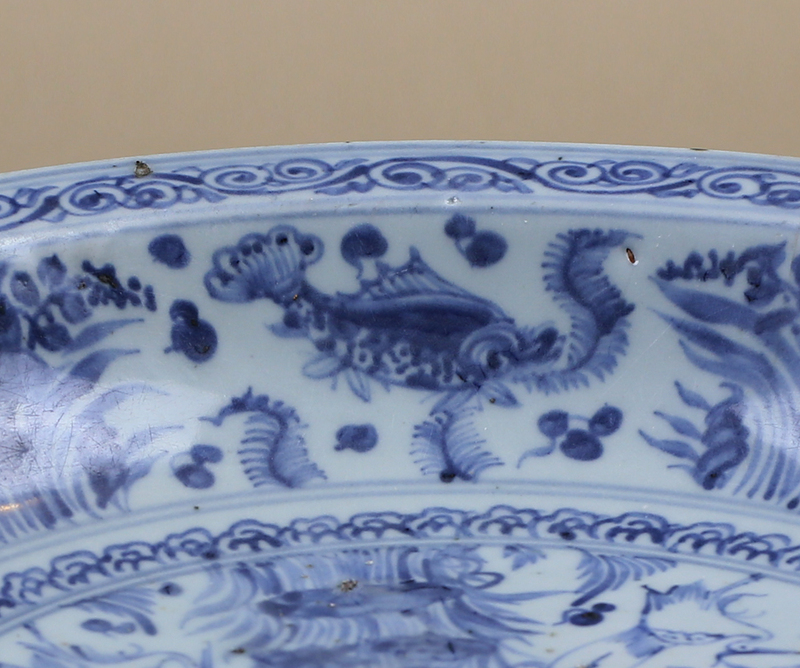 What is most interesting about this dish is that it essentially mimics much older Yuan designs and motifs. 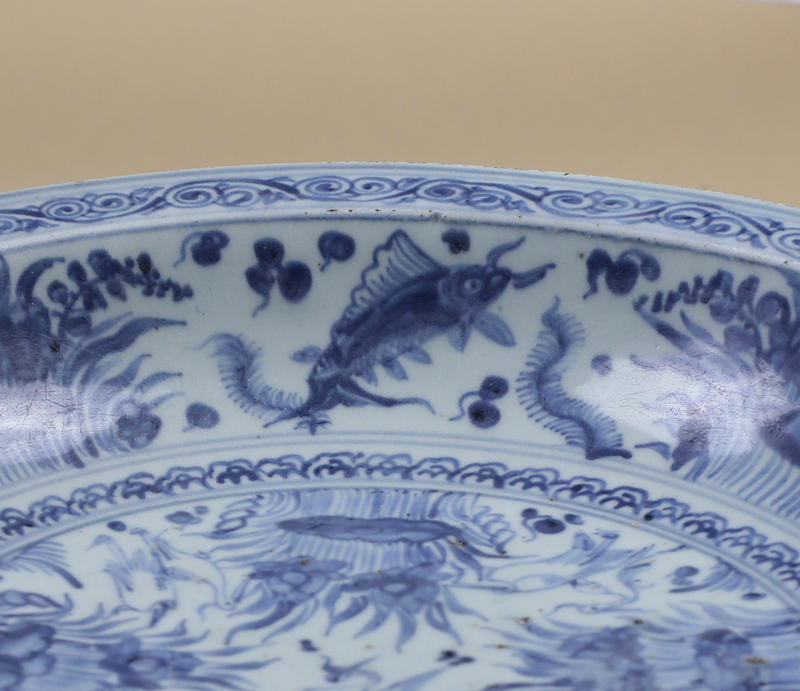 The cavetto’s large fishes swimming among aquatic plants is almost a direct copy from Yuan sources. 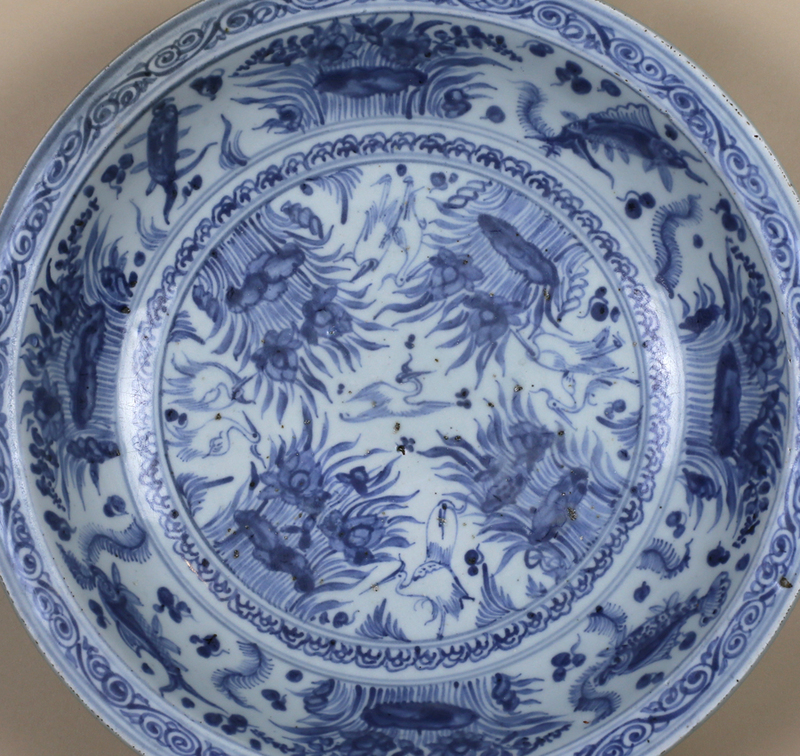 The arabesque scroll seen along the flat edge, as well as the sea-grasses painted in the central field are all elements frequently seen in Yuan blue and white chargers. 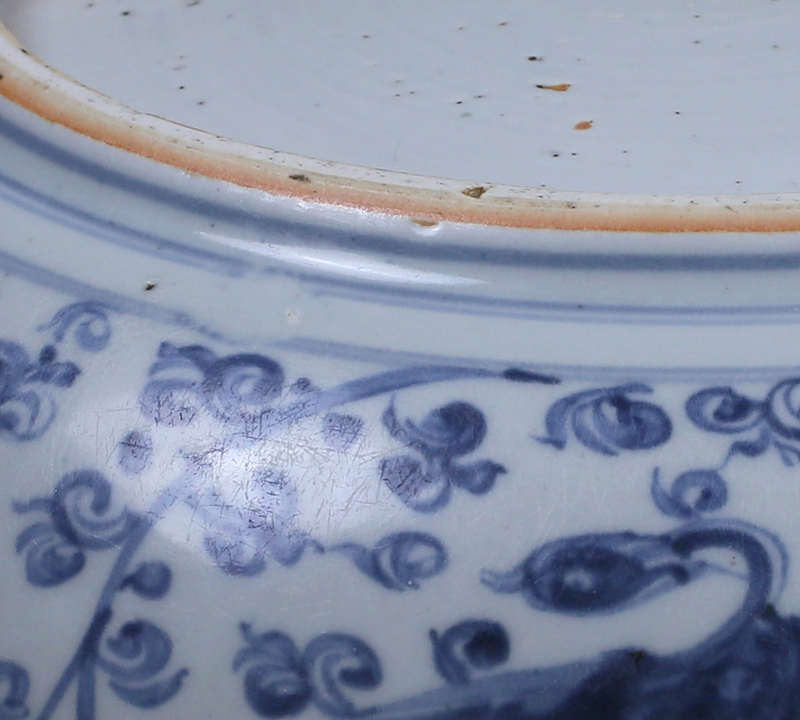 It could be that the 16th century was one of revivals for Chinese pottery making; Longquan potters during this same period were creating glazes and pieces that were influenced by earlier yaozhou greenwares. 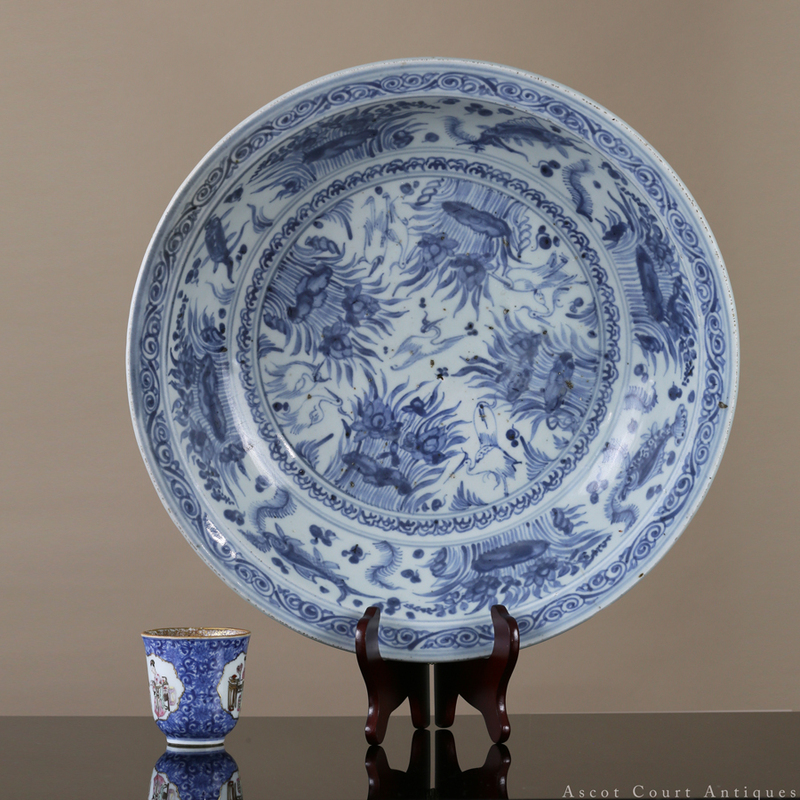 For dishes from the same mid-Ming period, consult Chinese Porcelains from the Ardebil Shrine by John Alexander Pope, plates 72 and 78.